If you are an Android gamer you might like to know that a hugely popular game that has already been available for iOS for quite some time, has now made the jump to the Android platform, and that game is called Jetpack Joyride, which in terms of demand and interest ranks up there with the likes of Temple Run, although Android gamers wont find Jetpack Joyride on Google Play but rather can gain the app via the Amazon App Store. 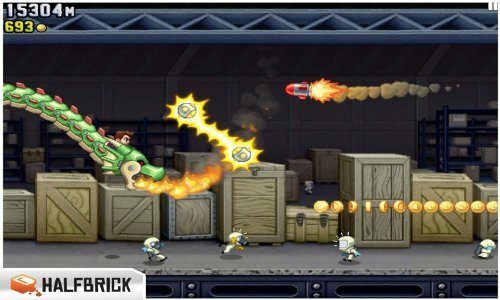 The news of Jetpack Joyride becoming available for Android gamers comes our way courtesy of Android Police, and the games has the gamer playing the role of square-jawed hero Barry Steakfries with the mission to break into a secret lab to steal experimental jetpacks from evil scientists. With Jepack Joyride for Android the gamer kicks things off utilising the Machine Gun Jetpack, and work your way through the mayhem collecting coins and finishing missions to access new gear in The Stash such as a snazzy outfit, new jetpack, and other collectable stuff, with upgrades including a laser jetpack, flowery lie and grass skirt, a steam powered jetpack, a zombie head and more. The Android version of Jetpack Joyride also offers dynamic addictive gameplay, great visuals, unlockable achievements, a cartoon-ish art style, and online leaderboards. Apparently the Android Police guys gave Jetpack Joyride a whirl on the Asus Transformer Pad to see just how the game handles on a tablet, and say although the game ran fine the graphics were a tad blocky, but it is possible Halfbrick will release a tablet version of the game at a later date. Anyway, for those Android gamers that would like to give Jetpack Joyride a go on their Android device you can download the game for free by hitting up the Amazon App Store. This is the best GAME IN DA WHOLE WIDE WORLD……….exept for halo reach….